Despite the illegal nature of cannabis in her country, this woman says thanks to Prince Charles she will continue to grow her medication. After being arrested for growing cannabis in her home, Michelle X, known for her role in the Channel Five TV documentary “37 Years On The Dole,” stated that she’d heard Prince Charles discuss its medical properties in relation to Multiple Sclerosis, a disease which she suffers from. After trying many other harsh medications, she turned to the natural remedy and didn’t think she deserved to be punished for her decision. 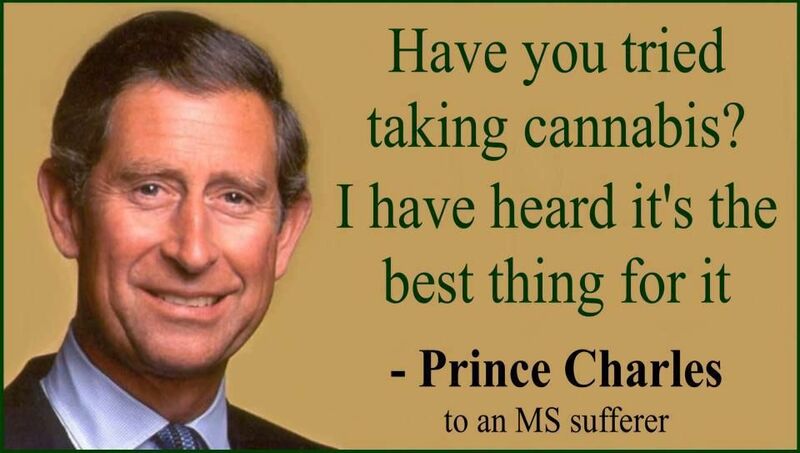 In the 1990’s, Prince Charles was seen across national TV stations addressing Multiple Sclerosis suffers, and asking one of them if they’d tried cannabis to help alleviate their symptoms because he’d heard it was the best. Michelle X took this bit of information to heart and began a cannabis regimen herself. Despite the illegal nature of cannabis in the U.K., Ms. X continued using the plant after nearly ten years of traditional, cancer-causing medications had failed her. At this point I thought if a member of the Royal Family knows about this plant, I should investigate it further. At just 49-years-old, Ms. X was making an attempt at regaining some kind of control over her life and her symptoms and did, in fact, find relief with the medical cannabis she had grown. After being diagnosed with the condition in 1987, Ms. X lost her job and became wheelchair-bound. The cannabis was helping her to reduce spasm and regain mobility of her legs. While standing trial in front of the Oxford Crown Court for growing illegal cannabis, Ms. X told judges that her inspiration came from Prince Charles himself and that yes, she grew the cannabis, but she shouldn’t be punished because the drug laws are unfair. She had already suffered enough, dealing with her condition and having lost her job. Ms. X informed the court that she had also been evicted from her home in the wake of the arrest and surrounding allegations that were propelled from it. Despite the charges, Ms. X assured the court they were just wasting money by continuing to prosecute her and that she had no intentions of stopping her grow operations. You are just costing yourselves, by paying my benefits, and I’m just going to keep offending until the law is changed. I will go on doing this even if it ends up with me in jail. I am willing to give my entire life for it. I stand by my words 100 per cent. Ms. X even went as far as to say the reason she was able to stand to address the court, rather than remain seated, was due to the relief she found through cannabis. While some were moved by her words, they did little to sway the judges. In an attempt to keep Ms. X from becoming a martyr for other illicit grow operations, no matter how noble the cause might be, judges fined her £200, or about $245, for taking up the courts time and costing them three days of dealing with the trial. However, she was given no jail time, but strongly warned against continuing to manufacture cannabis.